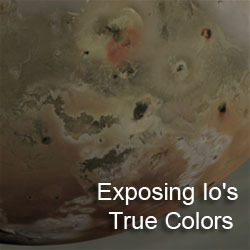 Continuing my series of posts covering the Io-related abstracts submitted for this year's Lunar and Planetary Science Conference, we come to "Classification of Io's Paterae: Active vs. Inactive" by Brandon Barth, Jani Radebaugh, and Eric Christiansen. This abstract takes a look at the distribution of paterae across Io by breaking the paterae down into those with dark floors and those without. For this abstract, Barth and his two advisers have gone back and mapped out these paterae, focusing on the color of each volcano, whether they are coated completely in dark material, only have some dark material covering their floors, or have no dark material at all. This goes a bit further than the earlier database developed in 2003 did when only the presence of dark materials were noted, not the percentage of coverage [at least not the version of the database I still have]. The authors examined their map to see how the distribution of paterae with dark floor materials compared to those without and to the general paterae distribution. Dark paterae material represent the surfaces of lava flows or lava lakes that are either active or haven't cooled enough to allow frost to condense on them, which would increase their albedo. The authors believe that mapping paterae with at least some dark floor materials acts as a good proxy for searching for volcanic hotspots, particularly in areas with poor thermal data from Galileo, such as across much of the leading and pro-jovian hemispheres. This is supported by high resolution thermal imaging of the Chaac-Camaxtli region, as noted in Williams et al. 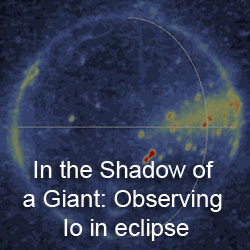 (2002), where all the areas where dark material was observed by SSI was associated with a hotspot. The authors noted some issues while mapping. For example, it became difficult to distinguish dark green material and black material. Green paterae floor material can result from the condensation of sulfur on still warm silicate flows or lakes. Another issue that arose was the low resolution of much of parts of the leading hemisphere, which made it difficult to resolve paterae boundaries. It also appears to have led some mountains being mapped as paterae, like Ethiopia Planum and Pan Mensa. 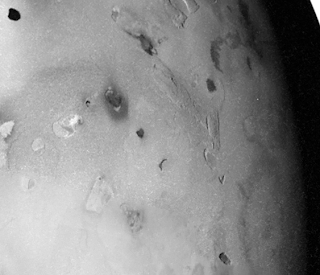 Their initial results suggest that paterae with dark floor materials have a similar distribution to the general population of volcanoes on Io. Like all paterae, there are peaks in longitudinal distribution centered near 150° and 330° supporting their initial hypothesis. They also find a slight difference in the number of active paterae between the sub- and anti-jovian hemispheres of Io, with 10% more in the anti-jovian hemisphere. There might be an observational bias due to the lower resolution between 30° and 70° on the sub-jovian hemisphere. Finally, they found a correlation between the size of the patera and the percentage of dark floor material. Large paterae tend to have a smaller percentage of dark material than smaller ones, suggesting that the size of paterae may not be related to the size of magma chamber. 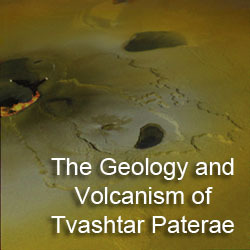 Therefore both large and small paterae would have similar amounts of magma available for an eruption, so large paterae would be more difficult to coat with fresh lava. The authors present this as a work in progress. They hope to further look at the connection between patera size and amount of dark material cover. Perhaps this could be linked with the geologic map Dave Williams and his colleauges have created as this would seem like a perfect example of the kind of statistical analysis that could be performed on the map. This would certainly justify all the misery the main author has had with ArcGIS he has mentioned on his blog. Research into paterae distribution, particularly ones with fresh deposits, can be useful in better understand heat flow in Io's interior. Radebaugh et al. (2001) and other studies found that paterae and hotspot distribution peaks near the sub- and anti-jovian points is consistent with tidal heating being centered in the asthenosphere. Though I wonder why recently active paterae show the same displacement from those points, since I would think there would be less lag for active lava flows as opposed to more stable geologic structures like volcanic pits.